The Aegean Sea is an arm of the Mediterranean Sea, between Greece and Turkey and extending down to the island of Crete. 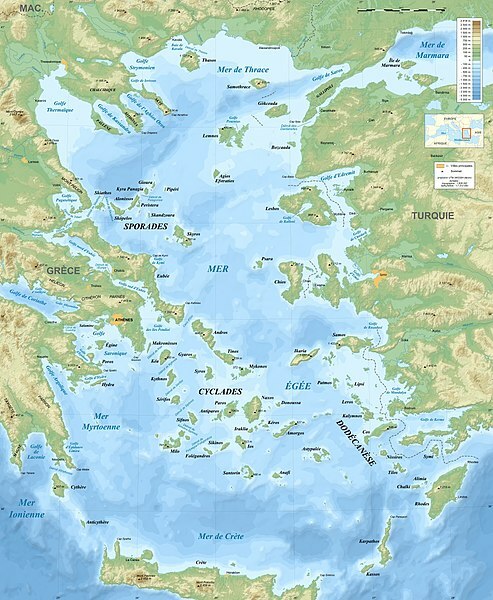 Most of the Greek islands are within the Aegean. 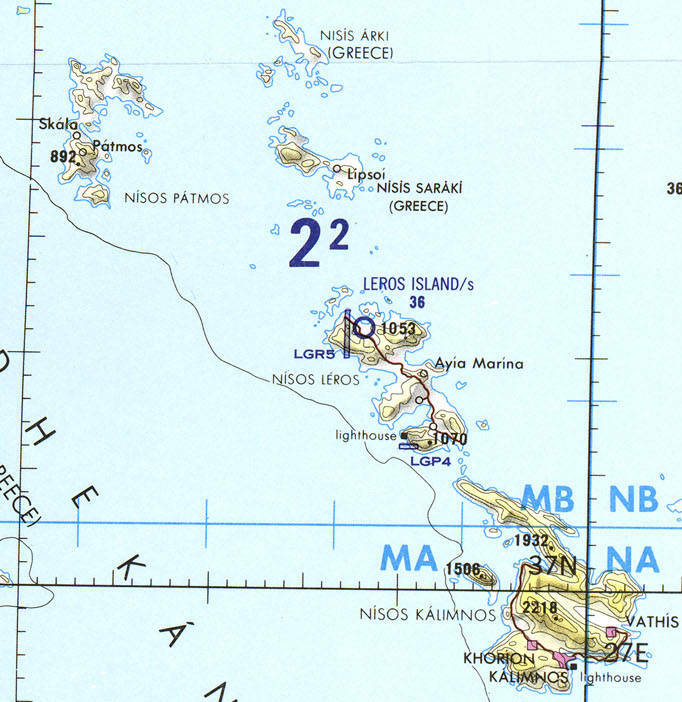 The Cyclades islands or Κυκλάδες are named for how they form a rough circle around the sacred island of Delos. They include the popular islands of Santorini, Mykonos, and Ios. 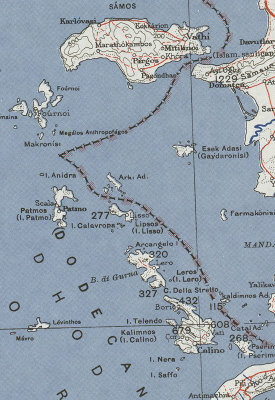 The Dodecanese or Δωδεκάνησα, literally the "Twelve Islands", are in the southeastern Aegean, off the coast of southwestern Turkey. Let's explore some of these islands! 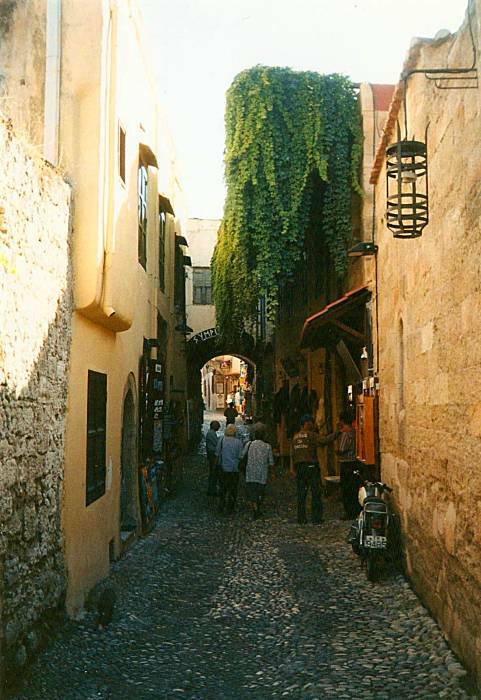 On this page I'll show you some sights and history of Patmos and Rhodes in the Dodecanese, Naxos in the Cyclades, and Samos just off the Turkish coast, where it may serve as your entrance to or exit from the Greek islands. Start planning your trip with the below search engine. You can research ferry schedules and prices, and you can even buy your ferry tickets online. 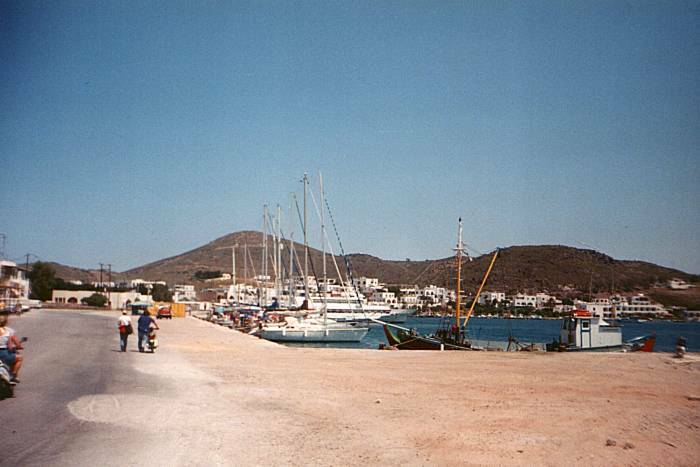 Patmos is a very nice island to visit. It's very small, and it doesn't get many visitors compared to tourist hotspots like Santorini and Mykonos. Who knows, maybe you will have some apocalyptic visions on Patmos. You wouldn't be the first visitor to do so. This is where The Revelation of Saint John the Divine was written. I, John, your brother and companion in the suffering and kingdom and patient endurance that are ours in Jesus, was on the island of Patmos because of the word of God and the testimony of Jesus. On the Lord's Day I was in the Spirit, and I heard behind me a loud voice like a trumpet, which said: "Write on a scroll what you see and send it to the seven churches: to Ephesus, Smyrna, Pergamum, Thyatira, Sardis, Philadelphia and Laodicea." I turned around to see the voice that was speaking to me. And when I turned I saw seven golden lampstands, and among the lampstands was someone "like a son of man," dressed in a robe reaching down to his feet and with a golden sash around his chest. His head and hair were white like wool, as white as snow, and his eyes were like blazing fire. His feet were like bronze glowing in a furnace, and his voice was like the sound of rushing waters. In his right hand he held seven stars, and out of his mouth came a sharp double-edged sword. His face was like the sun shining in all its brilliance. When I saw him, I fell at his feet as though dead. Then he placed his right hand on me and said: "Do not be afraid. I am the First and the Last. I am the Living One; I was dead, and behold I am alive for ever and ever! And I hold the keys of death and Hades. Write, therefore, what you have seen, what is now and what will take place later. The mystery of the seven stars that you saw in my right hand and of the seven golden lampstands is this: The seven stars are the angels of the seven churches, and the seven lampstands are the seven churches." 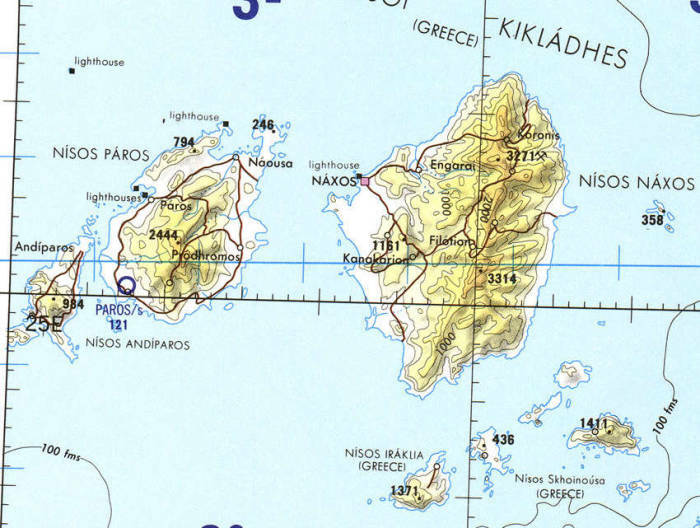 This first map shows Patmos between the red markers, just south of Samos and not too far from the Turkish coast. The other maps from the Perry Castañeda Library Map Collection at the University of Texas cover smaller areas in more detail. 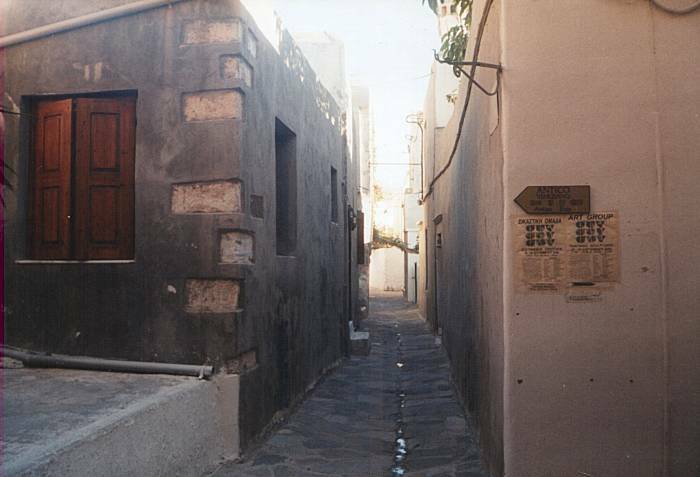 A number of early Christian basilicas were built on Patmos, including a large one built about 300-350 in honor of Saint John of Patmos. However, Arab raids in the 6th through 9th centuries destroyed the large basilicas and very nearly ended the Christian settlement of the island. The Byzantine Emperor Alexios I Komnenos gave the church complete authority over the island, and a monastery started construction in 1101. The population was later swelled by Byzantine refugees fleeing the fall of Constantinople in 1453, and the island came under Ottoman control. The control was remote and the island was given a great deal of autonomy. The Turco-Italian war in 1912 led to Italian occupation of all the Dodecanese, lasting until 1943 when Nazi Germany took control of Patmos. 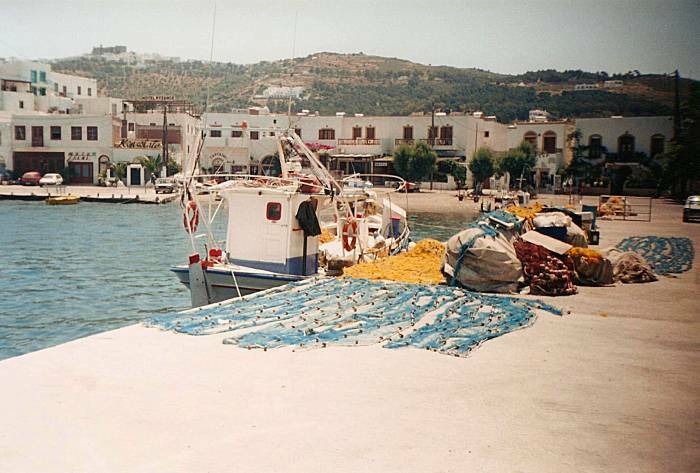 The Germans left in 1945 and Patmos was an autonomous island until joining Greece in 1948. The highest point on the island is named Moni Profitis Ilias, or Mount Prophet Elijah, as is common to so many Greek islands. Its peak is at 892 feet or 272 meters. Skala is the port, on a narrow isthmus that barely connects the two sections of the island. The Hora or largest town sits well above the port. The whole island has a population of about 3,000. The Monastery of Saint John the Theologian is the primary monastery on the island. It was founded in 1088, and about 40 monks reside there now. The Codex Petropolitanus Purpureus is a 6th century Greek New Testament book containing the four Gospels with many lacunae or missing segments. It was created in the imperial scriptorium in Constantinople in the 500s. The western Crusader forces who sacked Constantinople in the 12th century cut it apart and the pieces were scattered all over Europe. Czar Nicholas II of Russia purchased the largest part of it for the Imperial Public Library in Sankt-Peterburg in 1896. Of the 231 extant folios of the manuscript, 182 leaves are in the National Library of Russia in Sankt-Peterburg and 33 are in the library of the Monastery of Saint John the Theologian on Patmos. Then there are 6 in the Vatican Library, 4 in the British Library in London, 2 in the National Library of Austria in Vienna, 1 in the Byzantine Museum in Athens, 1 in the Museum of Byzantine Culture in Thessaloniki, 1 in the Morgan Library in New York, and 1 in a private collection in Italy. The monastery's library also contains, among other significant documents, Uncial 0150 and Uncial 0151, two 9th century codexes with the Pauline epistles, and the Miniscule 2464, a 9th century manuscript with the Acts of the Apostles, the Pauline epistles and the general epistles of the New Testament. The monastery complex also contains the Cave of the Apocalypse, a grotto believed to be where John of Patmos received his apocalyptic visions. The next destination here, Rhodes, is the large and easternmost Greek island, just south of the Turkish port of Marmaris. Rhodes is very nice at night in October, when the tourists are gone and the walled old city is like something out of an Errol Flynn movie. In the daytime when the cruise ships are in port, or apparently most anytime in the high season (July and August), it can get crowded. 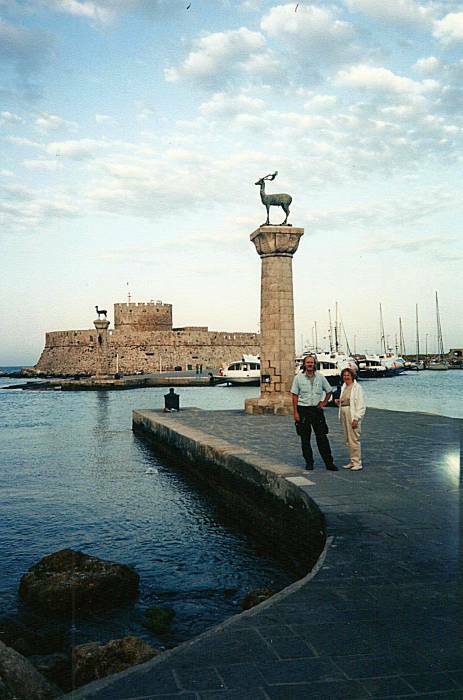 The harbor was the site of the Colossus of Rhodes, one of two of the Seven Wonders of the Ancient World to have been in today's Greece. Fanciful representations depict it as straddling the harbor opening. 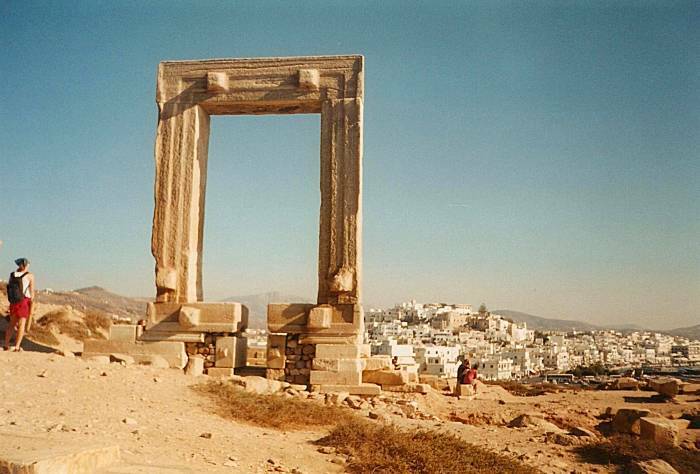 Really it was a tall statue that stood on one side or the other, where you now find two columns holding stags. There is a nice hostel, really more of a domatia or pension, in the old city. You see its entrance below. Go through one of the immense gates in the old city walls from the dock, turn right (west). If the first square with a fountain you encounter isn't Plateia Hippocrates, it will be the next one in the same direction. Keep going that way on Soukratous, which will go up a gentle slope. About a hundred meters from that fountain, an old mosque stands out over the left half of the street. Turn left under that overhang, the hostel is at 12 Ergiou, and the entrance will be a door down a side alley to your right. Their phone is +30-22410-30491. 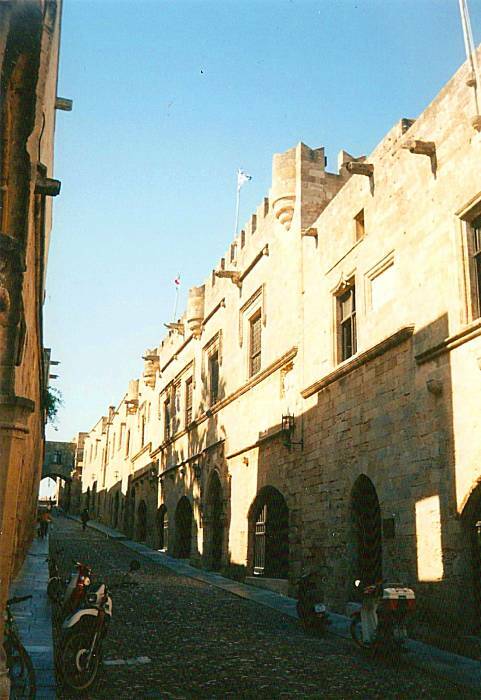 The Knights of Saint John ruled Rhodes from 1309 until they were driven out by the Ottomans in 1522. This is the Avenue of the Knights, or the Street of the Seven Tongues. The knights were divided into "tongues" based on their place or origin and thus language — England, France, Germany, Italy, Aragon, Auvergne, and Provence. The Grand Master of the Knights lived in the palace, and each tongue was supervised by a bailiff and was responsible for the defense of a section of the bastion. 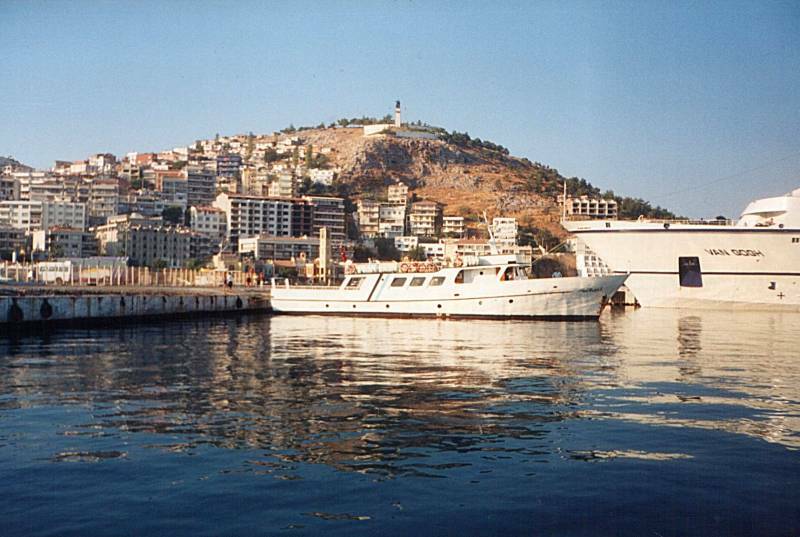 As for traveling between Rhodes and Turkey, ferries run between the main harbor on Rhodes and Marmaris. The animosity between Greece and Turkey requires you to set up this trip a day in advance, as each side blames the other for laborious paperwork. The hydrofoil ferry we see here is a Soviet surplus ones whose design embodies what people in the past thought the future was going to look like. These are Восход (Voskhod, meaning "Sunrise") passenger hydrofoils, also called Design 352 and Design 03521. They can carry 71 passengers, cruise at 60 kilometers per hour, and they have a range of 500 kilometers. They were built at the Море or or Morye shipyard in Crimea, Ukraine. 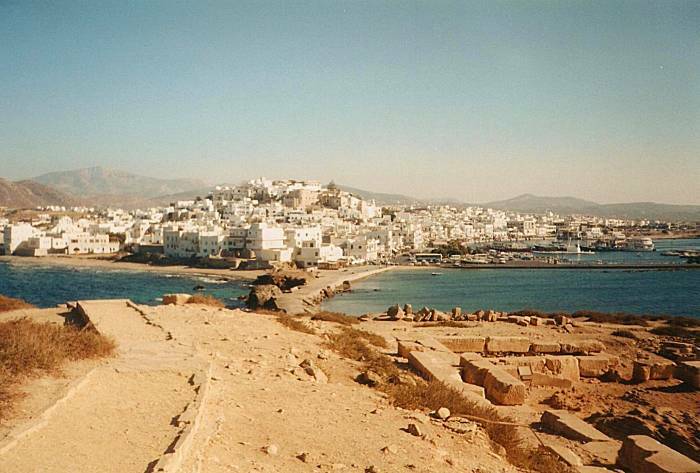 Naxos is yet another beautiful island. At 429 km2 it is the largest island in the Cyclades group. The largest town is simply known as Hora, as usual. It has a little over 6,500 residents. An explanation is in order: χωρα or hora is Greek for "town" or "municipality". The main town of most of the islands is called "Hora". We might as well say that each island has a main town simply referred to as "The Town". Mount Zas rises to 1004 meters and is the highest point not just on Naxos but also in the entire Cyclades. It is tall and wide enough to catch some clouds and draw some more rain to the island. This has led to much greater than usual agricultural activity in vegetables, fruits, and even cattle. The Greeks know Naxos as a source of good potatoes. 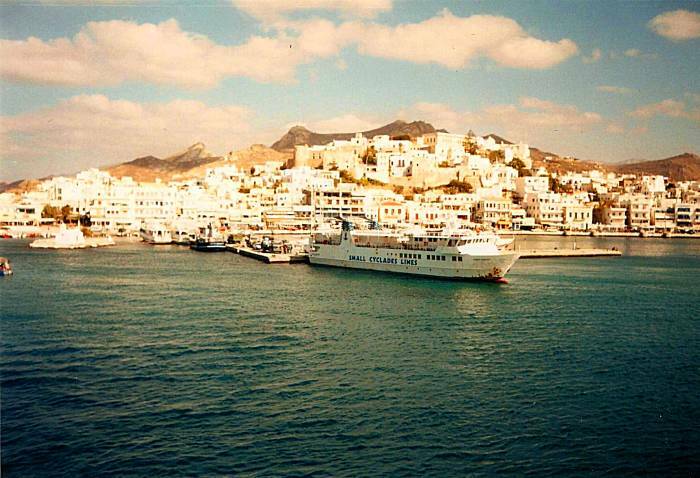 Naxos is more self sufficient than other islands. Greek mythology says that Zeus was raised in a cave on the highest mountain — Mount Zas referring to Zeus. Homer refers to Dia, a sacred island with name literally meaning "of the Goddess". 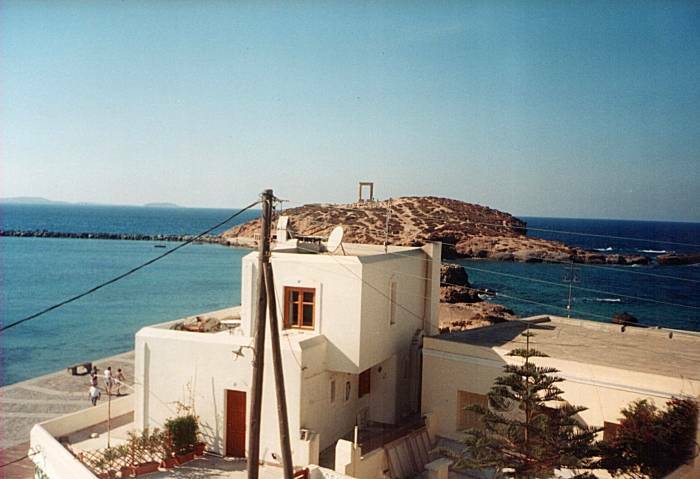 The name Dia was generally applied to small islands close to larger islands, and even to Naxos itself. There was a legend that before the Trojan War, in what is called the Heroic Age, Theseus abandoned Ariadne on Crete. This was after Ariadne had helped Theseus kill the Minotaur and escape the Labyrinth. This was not very gallant of Thesus. Dionysius, the protector of Naxos and the god of wine, fell in love with her. In more conventional history, the Revolt of Naxos led to the war between Greece and Persia. Persian forces attacked Naxos in 502 BC. The attack was unsuccessful, but it led to the Ionian Revolt, a rebellion of several prominent Greeks against the Persian Empire pressing against Ionia at the time, and that led in turn to the war between Greece and Persia. Some classic era ruins remain to be seen today. Above you see the main doorway and other remains of the Temple of Apollo on the islet of Palatia, connected to the dock area and the Hora by a narrow walkway. It's thought to date back to about 530 BC. In 1207 AD, after the Fourth Crusade, a Venetian adventurer named Marco Sanudo took advantage of the Venetian influence at Constantinople. He captured first Naxos and then the rest of the Cyclades. This established the Duchy of the Archipelago, which controlled the Cyclades through 1566, with Venetian control of some scattered Aegean islands through 1714. The Ottoman Empire held nominal control over Naxos from 1566 through 1821, although it remained effectively controlled by the Venetians as the Ottomans were satisfied by collecting taxes from the island. The islands revolted in 1821 as part of the Greek War of Independence and became part of the Greek state in 1832. Nearly 4,000 people live in the Hora. The island has been inhabited continuously since Neolithic times. Traces of a settlement going back to Mycenaean times can be seen near the Orthodox cathedral. The Venetian control led to a Roman Catholic presence which still exists, there is also a Roman cathedral within the walled kastro at the core of the old city. 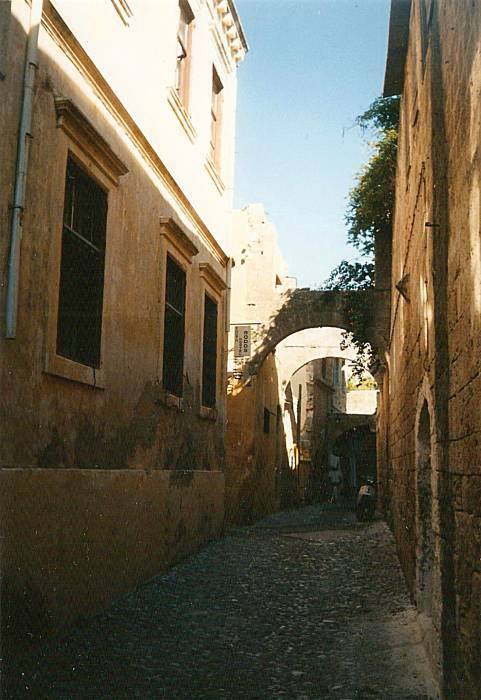 The narrow twisting passageways of the kastro are interesting to explore. 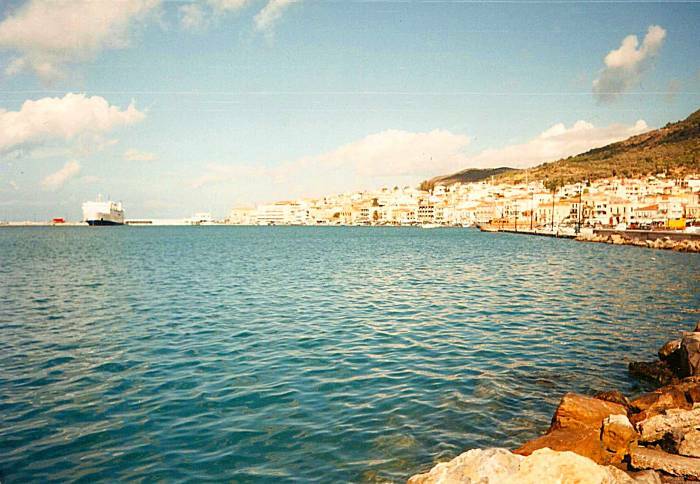 If you are traveling between the Greek islands and Turkey, you are likely to pass through Samos. 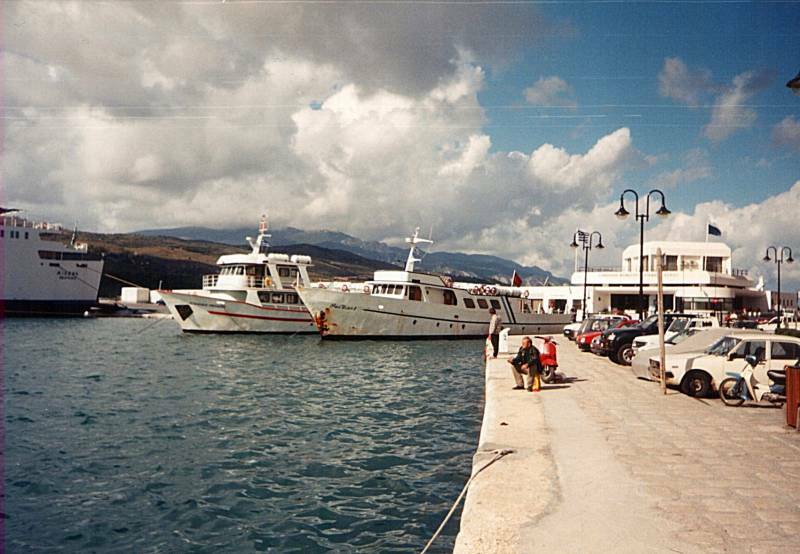 A small ferry links Samos with the Turkish port of Kuşadası every day during the high seaon. 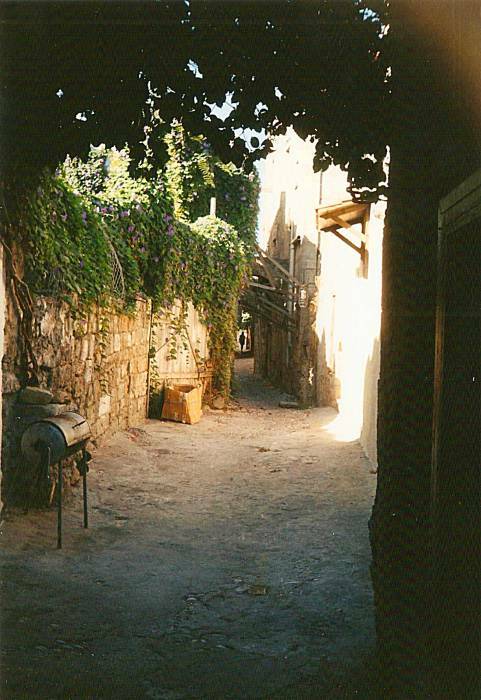 It is a short dolmuş ride from Kuşadası to Selçuk and the ancient city of Ephesus. 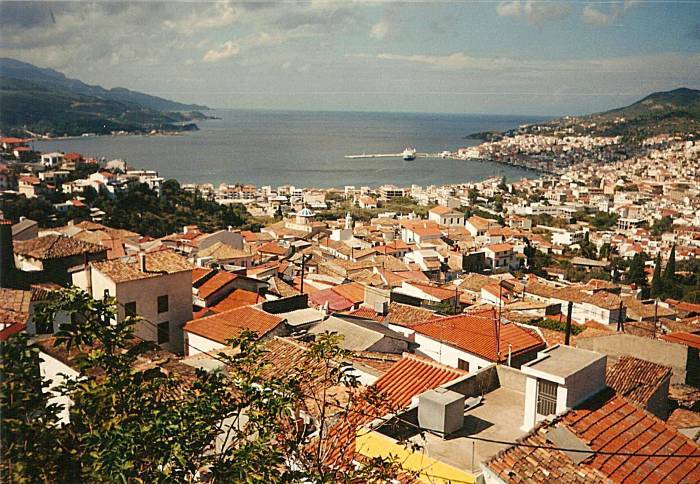 The island's capital of Vathi, also called Samos, is a large town by island standards. But then Samos is a fairly large island. Samos is a transport hub of the north-eastern Aegean, with ferries west to Piraeus, south to the Dodecanese islands, and southwest to the Cyclades. Olympic Airways also links Samos with Athens several times a day in high season. 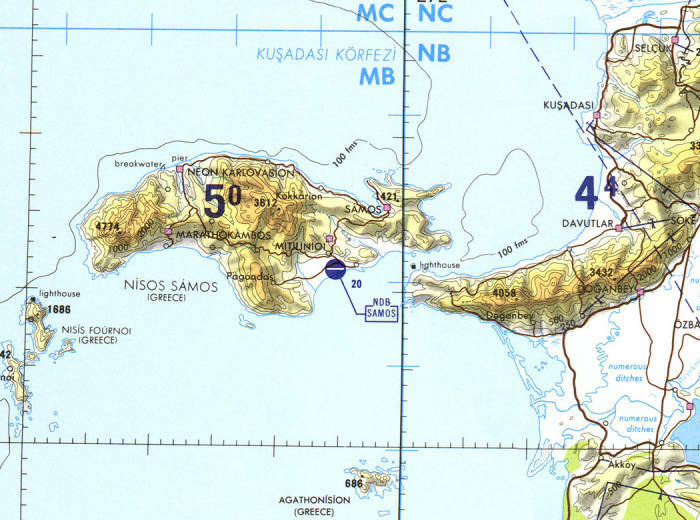 Samos is just three kilometers off the coast of Turkey, separated by a narrow channel. But the ferry connection covers a much longer distance between Kuşadası and Vathi. This small ferry is preparing to leave Kuşadası and cross to Samos. 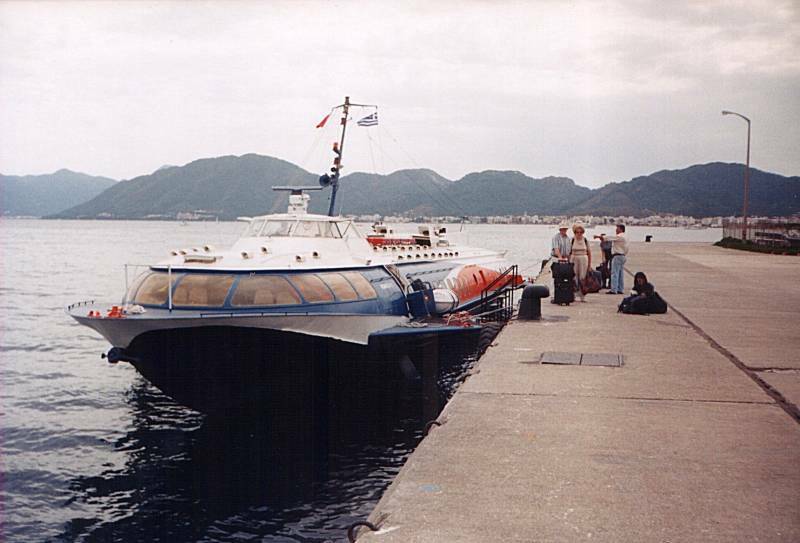 This small ferry from Kuşadası has arrived at Samos. Neolithic era finds show that Samos has been inhabited at least since the third millennium BC. Samos was colonized by Ionian settlers, who also settled along the coast and inland into far western Asia Minor. Its position near trade routes made it one of the leading Greek commercial centers by the 7th century BC. They had trade relations with Asia Minor, of course, but also with communities around the Black Sea, in Egypt, and in Libya. The Samians are said to have traveled and traded as far west as the Straits of Gibraltar, the extreme end of the Mediterranean. Pythagoras and Aesop both lived on Samos, as did the philosopher Epicurus and the astronomer Aristarchus, who is credited with developing the first heliocentric model of the Universe. That is, that the Earth moves around the Sun and not vice-versa. The island played a major role in the Greek War of Independence in 1821-1832. While the Ottoman Turks re-took the island, they granted it effective autonomy as long as the Samians paid an annual fee of £2700. The island remained effectively independent until 1912, when it officially became part of the Kingdom of Greece. Samos was occupied by Axis forces during World War II, first by the Italians and later by the Germans.